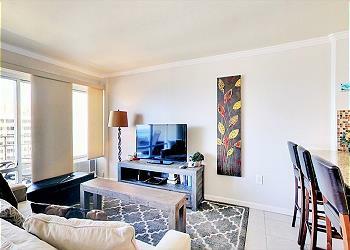 Huge studio with full kitchen equipped with tools. King size bed, a full size and single size sofa beds provided in the unit for large group. 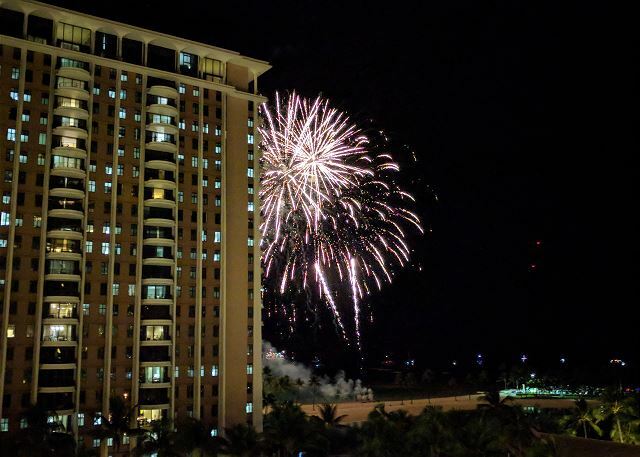 Enjoy the Friday night fireworks from your lanai. It also provides free Wi-Fi is provided in the room, a flat screen TV, and a kitchen filled with cooking supplies will be ready to use if you like to stay inside. A folding door installed to separate the room from the main bed and the living area. Pool located on 1st and 2nd floor. Coin laundry located on same floor. 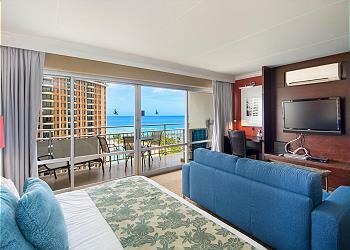 You can walk to Ala Moana Beach park, Hawaii Convention Center and Ala Moana Center, the largest outdoor mall in the country. Paid parking is available on site, $28/day for Ilikai Hotel valet parking, or $23/day for Ilikai Marina’s parking (Price and availability may change) . floors were dirty,pillows stunk,mattress cover very filthy,refrigerator handles very filthy-looked like they belonged in a mechanics shop,balcony floors&rails filthy and had bird droppings on rails&floors,sliding door tracks had not been cleaned in months,very stick and hard to slide& open,mirrors were dirty,A/C kept you awake at night& very noisy when compressor kicked on&off and would not cool the place from 9 AM until 4 PM because the cheap curtains were like sheers and put such a glare on TV you could hardly see during the day. A/C vent was nor positioned properly to benefit the unit,vents went directly into the nightstand and under the bed in the corner and could not get out into the room!! Ever who they got to install A/C was a complete amateur because he cracked the window where he installed,left long screws sticking out into lanai area to cut or hurt any child playing on lanai,did not caulk piece of open space between a/c and wood strip leaving more air loss!!! Door handle on bathroom door very loose,shower stall floors filthy, patio furniture old,rusty,very uncomfortable-looked like garage sale or throw away merchandise,so was mattress,stools, small sectional sofa!! On the bright side T.V. Large sofa,T.V. Stand& chaise lounge on Lanai were new & very nice.!! On the other hand, I would not recommend Myland Realty or this unit to anyone who wants to be comfortable and get value for their money while in Hawaii !!! Mother and Daughter from MN Give Two Thumbs Up! Cute, cozy and clean! Great view of pools, lagoon and ocean. 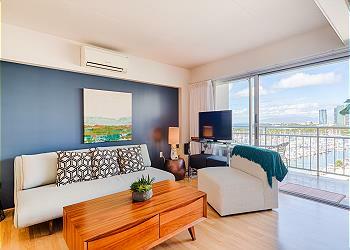 Convenient on-site market and concierge. Good communication with management company. 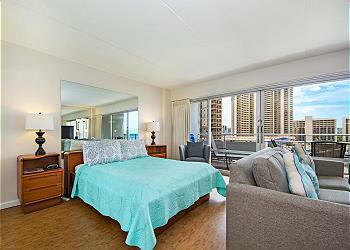 Don’t pay for pricey hotels when you can get more space for half the cost at this condo! 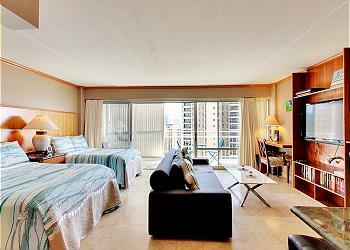 Located in the famous Ilikai Hotel and Luxury Suites. Short walk to the beach.